Diaspark Energy is a comprehensive asset management software platform that helps to enhance performance of your PV portfolio effectively by having more transparency. It enables you to work from a single point of access for entire chain of O& M, Asset Management and Analytics. How your business can get better? Asset Management comprises of commercial, financial and administrative activities required for smooth operations of any solar PV system. Diaspark Energy take cares of all PV asset related needs with its enterprise grade Asset Management Software Platform. Solar plant owners rely on O&M service providers as specialists to take care of their solar assets over the long haul. To deliver the commitment of end-to-end maintenance and superior performance, O&M service providers are faced with multiple challenges such as handling bulk alerts based on priority, effectively setting up contracts & compliance with vendors, and tracking technicians based on the issue, location, and managing repair orders. Precise monitoring & predictive modelling tools to compare similar systems by normalizing parameters such as azimuth, weather,etc. 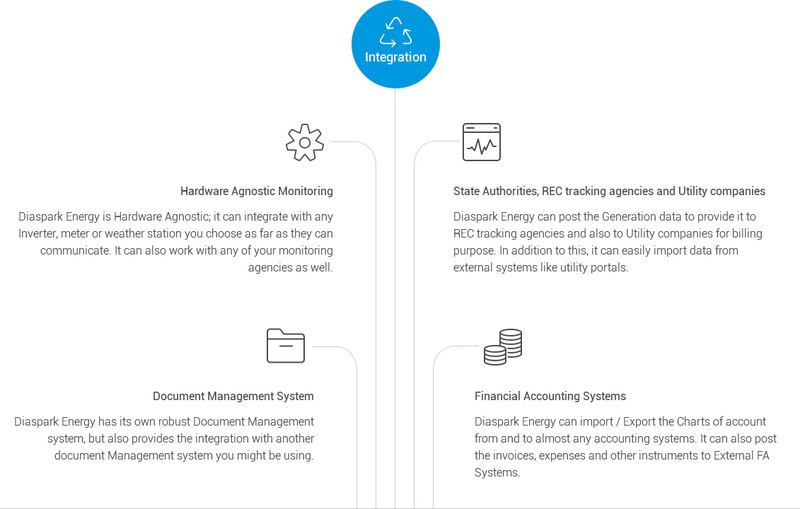 Diaspark Energy Platform is built on a very adaptive Framework which lets it integrates with other applications and legacy software seamlessly. Including, but not limited to your Financial Accounting Systems, Document management systems or Mails. It already has integration with much Utility companies, REC tracking companies, and state regulatory authorities and is future ready to accommodate any systems. Holistically monitor & manage grid operation by integrating energy generation assets, monitoring systems, supervisory reporting and risk management & compliance practices. Automate the process of gathering data from meters and intelligent devices by collaborating it with digital sensors, network & data administrators and analytics. Integrated communication set-up enables to manage & monitor the network for secure information exchange which improves productivity and performance by connecting intelligent devices to reduce cost & mitigates risk.